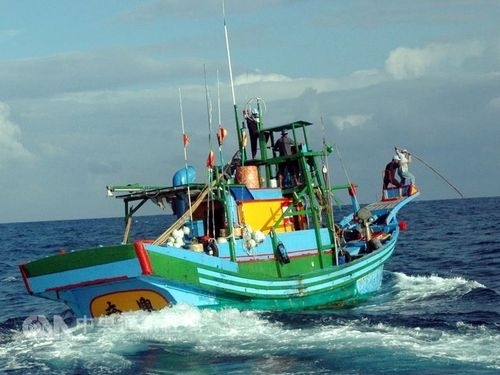 Taipei, March 17 (CNA) The seventh meeting of a Taiwan-Japan fishing commission concluded Sunday, one day after originally scheduled, due to the number of issues brought up, including a Taiwanese fishing boat that was chased off with water-cannon fire in disputed waters earlier in March. According to a statement from the Ministry of Foreign Affairs (MOFA), the meeting for the most part reaffirmed an agreement that the two countries first entered into in April 2013, through which they agreed that both sides could fish within a 74,300-square- kilometer area around the disputed Diayutai Islands in the East China Sea. The rules for fishing and fishing boats traveling through the designated area remain the same, except within a zone, shaped like an inverted triangle, north of the Yaeyama Islands, that is encompassed within the original agreement. While MOFA has not yet revealed what changes have been made to regulations in this particular zone, one source, who spoke on condition of anonymity, said the changes will be implemented on a trial basis starting April 7, which is the start of the fishing season. MOFA instead has said that it will leave it to the Fisheries Agency to reveal more information about the changes in the regulations. The source also revealed that Taiwan asked during the meeting to have the area south of the Yaeyama Islands and north of 27 degrees north latitude to be included in the area where both countries can freely operate and travel. This petition comes after Taiwanese fishing boat the Tung Pan Chiu No. 28 crossed the line and was chased off with water cannon by the Japanese authorities. The area, although currently not governed by the Taiwan-Japan fisheries agreement, is part of an overlapping area of Taiwan’s and Japan’s exclusive economic zones.